Transparency Market Research (TMR) has published a new report titled, “Substance Abuse Treatment Market - Global Industry Analysis, Size, Share, Growth, Trends, and Forecast, 2018–2026”. According to the report, the global substance abuse treatment market was valued at US$ 8,000 Mn in 2017. It is projected to expand at a CAGR of 8% from 2018 to 2026. The report suggests that emerging initiatives by manufacturers and governments and rise in abuse of prescription drugs are anticipated to boost the global substance abuse treatment market from 2018 to 2026. North America and Europe are expected to dominate the global substance abuse treatment market in the next few years, owing to market availability of new drugs and technology, rigorous research and development by major companies, and strong medical infrastructure. Players are continuously working in the global substance abuse treatment market. They also enter into distribution agreements to strengthen their presence across the globe. Key events in the market include submission of provisional patent application to the USPTO for proprietary pure cannabidiol compositions by Normaco in October 2018, approval of SUBLOCADE, by the FDA, launched in the U.S. in March 2018, and U.S. FDA approval for the ANDA for methadone hydrochloride (5 mg and 10 mg) tablets for Glenmark Pharmaceuticals and its strategic partner Elite Pharmaceuticals, Inc in August 2018. The report offers detailed segmentation of the global substance abuse treatment market. Based on treatment type, the global substance abuse treatment market has been classified into alcohol addiction treatment, nicotine addiction treatment, and drug abuse treatment. The alcohol addiction treatment segment is likely to expand at a notable growth rate during the forecast period due to increasing adoption of alcohol across worldwide, rising use of medicines for restrictions of alcohol and relatively lower cost per prescription for these medicines. The duration of action is also an important driver of the segment. The drug abuse treatment segment held a major share of the market in 2017, followed by the nicotine addiction treatment segment. High market attractiveness of drug abuse treatment and nicotine addiction treatment segments is due to the availability of different nicotine replacement products over-the-counter in order to combat tobacco and nicotine addiction and an increase in adoption of prescription opioids or illicit drugs. Nicotine replacement therapy (NRT) products contain low concentration of nicotine, which helps reduce cravings caused by nicotine addiction over time. The therapy requires cigarette smokers to gradually cut down on the usage of these aids, thereby reducing the dependence on nicotine and eventually, helping them to quit smoking. On the other hand, expansion of the drug abuse treatment segment is attributed to a rise in the number of cases of usage of prescription drugs/illicit drugs, increase in the number of deaths from excessive use of prescription drugs, and surge in research & development by leading pharmaceutical companies. Based on distribution channel, the global substance abuse treatment market has been categorized into hospital pharmacies, retail pharmacies and drug stores, and others (online sales). Expansion of the segment can be attributed to the rise in prescription filling at hospital pharmacies, availability of certified physicians in hospital pharmacies, advice for use of the drugs from certified physicians, and authenticity of quality and price of the medicines. In terms of revenue, North America dominated the global substance abuse treatment market in 2017. 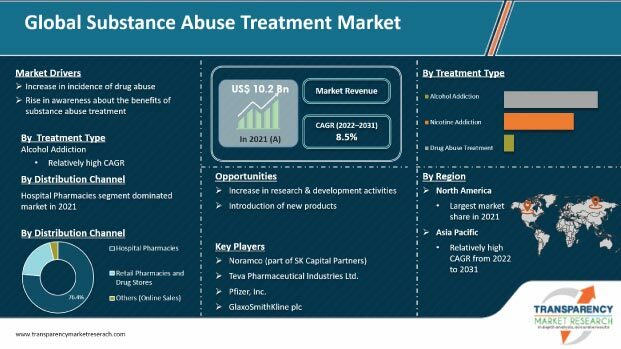 The substance abuse treatment market in Asia Pacific is anticipated to expand at a considerable pace during the forecast period. Excessive use of prescription medicines is likely to lead to an addiction to prescription medicines, which may cause psychotic abnormalities. Additionally, several cases were found in India where high doses of prescription medicines caused deaths. Therefore, hospital pharmacies are considered to be the preferred option for obtaining prescription medicines in Asia Pacific. According to a government report, in China, the number of illicit drug users rose 7% in 2016, as compared to the previous year. The substance abuse treatment market in Australia & New Zealand has reached a mature stage. According to the National Drug Strategy Household Survey 2016, nearly 3.1 million people above the age of 14 in Australia used illicit drugs. Moreover, the use of methamphetamine is increasing in the country. The Government of Australia is focusing on various awareness programs and providing funds to improve treatments. The report also provides profiles of leading players operating in the global substance abuse treatment market are Alkermes, Allergan PLC, Indivior PLC, Noramco (part of SK Capital Partners), Teva Pharmaceutical Industries Ltd are the major players operating in the market, offering products with proprietary technologies. Other players include Pfizer, Inc., GlaxoSmithKline plc, Mallinckrodt plc, BioCorRx, Inc., and Glenmark Pharmaceuticals Ltd.